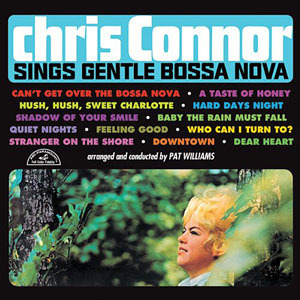 Frustrated by the lack of vocal musical opportunities in her hometown, Connor pulled up stakes and headed east in 1949. She was hired by Claude Thornhill and spent the next five years touring with his orchestra. Then, while appearing with Jerry Wald’s band, she received the phone call she had been dreaming of. June Christy, Stan Kenton’s current vocalist, had heard Connor on a radio broadcast and recommended her to the orchestra leader, who chose her from dozens of other vocalists eager for the job. “My voice seemed to fit the band,” Connor said, “with that low register like Anita’s and June’s. 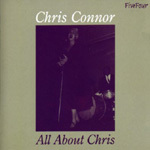 Determined to forge a career as a solo artist, Connor returned to New York and signed with Bethlehem Records in 1953. Her three albums for that independent label, featuring Ellis Larkins, Herbie Mann, Kai Winding and J.J.Johnson, established her as a major jazz voice. In 1956, she began a six-year association with Atlantic Records that produced a string of chart-topping recordings arranged by Ralph Burns, Al Cohn, Jimmy Jones and Ralph Sharon, showcasing a host of jazz legends - John Lewis, Oscar Pettiford, Lucky Thompson, Phil Woods, Kenny Burrell, Milt Hinton, Clark Terry, Oliver Nelson and, in a particularly memorable pairing, Maynard Ferguson’s big band. The rock youthquake of the late ’60s and ’70s derailed the careers of many jazz artists, but Connor persisted, performing in clubs, touring Japan and recording for a variety of labels. The early ’80s resurgence of interest in jazz singing revitalized her career, leading to a brace of highly-acclaimed Contemporary CDs. In the ’90s she began to record for the Japanese label Alfa. 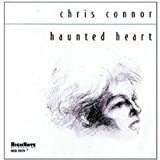 Connor recorded two CDs with jazz pianist Hank Jones and his trio, “Angel Eyes” and “As Time Goes By.” She then recorded two additional CDs with her own quintet, “My Funny Valentine,” arranged by Richard Rodney Bennett, and “Blue Moon,” a collection of movie songs, arranged by Michael Abene. The new Millennium brought the timeless singer into yet another recording agreement, signing with the New York based High Note Records in 2000. Her first release, “Haunted Heart,” also arranged by Michael Abene, was released September 2001, and a second CD I Walk With Music, was released in 2002, also with Michael Abene arranging and producing. Chris then returned to another Japanese label and recorded Lullaby Of Birdland for King Record Co.Ltd, with pianist/arranger David Matthews. It was released in September 2003. All About Jazz musician pages are maintained by musicians, publicists and trusted members like you. Interested? Tell us why you would like to improve the Chris Connor musician page.